How did we come across the idea of a new UI for Nimble Accounting? At Nimble Accounting we always strive to maximize user experience. This time we made the UI more intuitive and ergonomic. Nimble Accounting prides itself in the way it keeps operations simple and easy to use. This time the menus are reorganized so that they are more in sync with your workflow – you will need at most two mouse clicks to access any feature. The revamped UI is very intuitive and users can accomplish their desired tasks effortlessly even if they don’t have an accounting background. At the very top of the page are the various tabs that help you navigate to the areas of your Business account. You can even drill down to run reports and other detailed info, with identifiable menu tabs to access your required information. 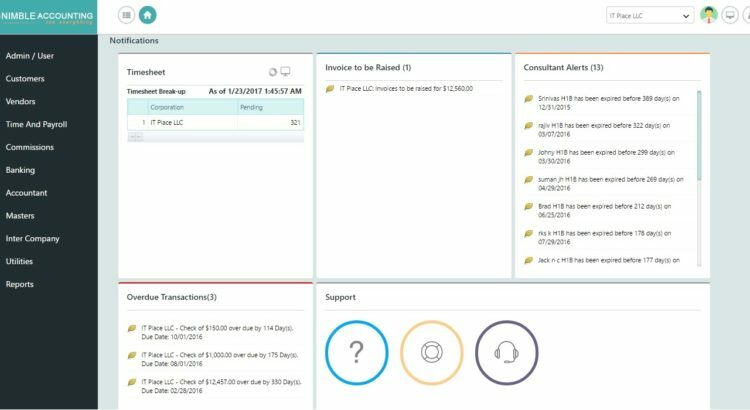 All notifications and alerts are displayed on the home screen like Pending Time sheet, Invoices to be raised, Consultant update alerts and Transaction over dues along with a dedicated widget for Help, Support and Quick tour. Menu Changes include second level Menu tab at the top of the page to facilitate quick access which is collapsible with clear Icon representation. Reports are regrouped based on user expectation so that you can access the needed report immediately and effortlessly. Once you get the hold on the UI, rest of the process is automated including back office workflow significantly saving data entry time. With the recently updated Nimble Accounting UI, we always look forward to ensure our designs will have a better basis for longevity, whatever the future throws at us. Is Help around when needed? Yes, help tutorials and videos are available for each feature and for those who prefer a self-paced training resource, an extensive knowledge base library is included which can be accessed from the Help menu within the program. Primary support includes phone, chat, and priority email support with Telephone and Chat support being available Monday to Friday from 8.30 AM – 5.30 PM EST.